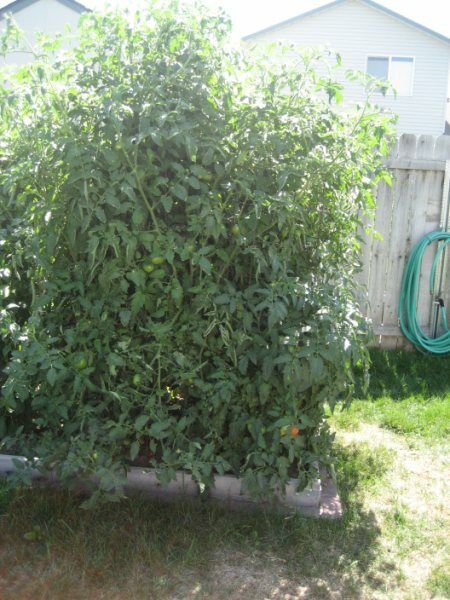 I’ve loved having my readers send me their square foot gardening plans and pictures. 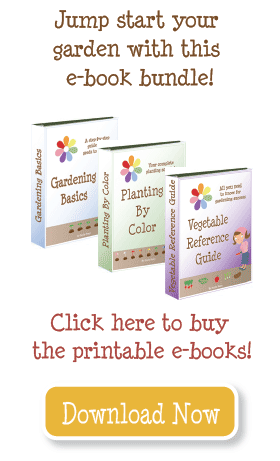 I found your website last night while doing some research on growing a square foot garden. It was so helpful! I found tons of great info. I was hoping you could take a look at what I have planned for this year and give me any feedback. This is my second year growing a garden, and I am hooked! I love it! We have a 4×16 foot garden and a 2×16 foot raspberry patch along a south fence. I didn’t use the SFG technique last year but I am interested in giving it a try. I have a couple of questions- first is can I really fit everything into my garden that I have planned without it being too crammed? Second, I was thinking about growing some kale where my peas will die out in the fall. I was reading that they can be grown after the frost. (I live near Boise, ID) Have you ever tried it? Third, what is it like to grow potatoes with SFG? It sounds a little complicated. Lastly, do you have any favorite varieties of broccoli, spinach, onions, carrots as I have never grown any of these vegetables. I have also attached a few of our pictures from last years garden. I went a little crazy with the tomatoes (we had 5). We have built some amazing cages using cement rebar that supports tons of vertical growth. 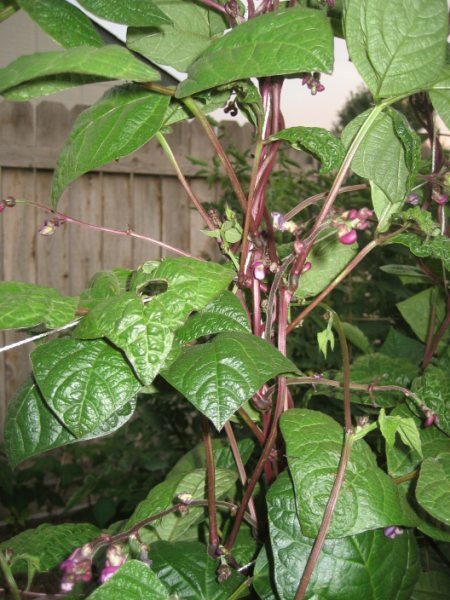 Also is a picture of our pole beans-purple. They are wonderful to eat! and beautiful! Thanks for any help you can give. I am excited to get started in a few months! These are the tomato cages she talked about. I’m definitely going to have her send us the plans for these–look how huge the tomatoes grew, and no falling to the ground! 1. Yes, you really can “cram” a ton of veggies into your square foot garden. You have to remember, square foot gardening gets rid of the rows, so you can fit a lot in a small space. 2. Yes, you can grow kale during cold weather! I have never tried it (growing kale), but I looked it up and you want to plant transplants 4-5 weeks before the last fall frost date. So, depending on when you pull up your peas, you may have room for them there. I would guess that you will have room–you can harvest a square or two of potatoes as new potatoes, your onions, carrots, and spinach will all probably be harvested by then. 3. I think growing potatoes with the square foot gardening method is FANTASTIC! Go here to read about how to do it. The only tricky part for you is that potatoes will compete with your root vegetables, so you might reconsider where you plant those. The way I do it, I remove the soil, plant the potato and when it sprouts, cover it with dirt until it reaches the top of the garden bed. Another option is to build up–plant the potatoes as far down as you can, then build a new layer with 2×10 boards. Add soil as the sprouts grow up. 4. I have liked the Green Goliath broccoli, other than that the varieties I planted are fine–nothing exceptional. * Carrots, potatoes, and onions are all root vegetables and will compete for space under ground. Consider staggering them with some lettuce or spinach–both grow well next to any vegetable. * Keep your onions away from your beans and peas. They do not grow well together. * Broccoli also doesn’t grow well near pole beans. Consider switching those around. Remember, you don’t have to keep all one type together. If you need to put a barrier between two veggies, use lettuce, carrots, or spinach to space it out. 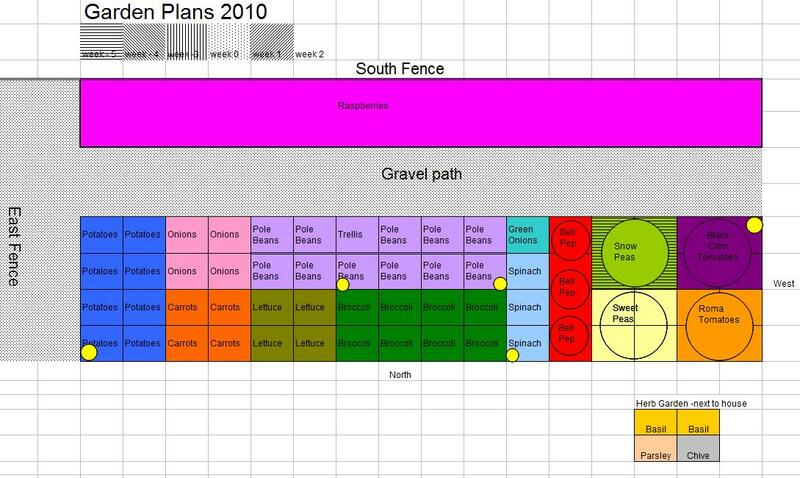 Once you have another plan–look through the companion chart to double check it before planting. Overall, this looks fantastic! I’m excited to see your progress this year. Please send me your tomato cage instructions, and follow up with photos and feedback at the end of the season. I want to start a Garden Gallery section for pictures. Your tomato cages seem so easy to build. Please send me information as to the specific materials that you used and retail stores that I can obtain it at. It’s a great idea to plant cool-veggies early in the spring, then pull them up to plant summer veggies. Certainly square foot gardening gives you the most bang for your buck. Be sure to divide your space into squares and follow the plant spacing suggestions. My only advice for first-timers is to start small, keep your expectations low, and enjoy the process! Just a quick question. This is my first time planting a vegetable garden and wanted some ideas as to what is best to plant (of course I would like to plant things I like) since is already June and I live in MA. I already have rosemary, cilantro, spinach and lettuce that I put in a planter. I have eaten most of the lettuce (cut and come again method and a lot of the spinach). I have decided to start small. The spot I chose is 4′ by 6′ and I am planning to plant peppers, move my tomatoes who already have flowers to this spot as well, cucumbers and maybe more lettuce. What do you think? I love the gardening plan here but my space is too small for all of it. Any advice for a first timer greatly appreciated. I just stumbled upon your website and LOVE it! Thanks for all of the tips and information this is just awesome! I’m planting a garden (first one in over 10 years!) and I really like your square foot garden technique. I do have a question and I hope this isn’t dumb but how do you weed and harvest your garden when all of your plants are so close together? Should I assume the diagrams you have posted allow for space between plants?? love that idea for the tomato cage. I got some tomato ladders enroute to try this year. I just did some quick research and updated my potatoes information. Let them sit until a crust is formed, a couple of hours to one day. I also realized that you should let them sprout first, so you know you’ll have 2-3 sprouts per piece. I have cut my pototoe seeds and I am wondering how long do I let them sit and form the crust? I have rotated, but not because of disease–mostly because I’m always trying to find a better garden plan! I did read about this, and rotating your potato crop will reduce the chances of disease. If you have healthy potatoes, it may not be such a concern. But if you have a diseased crop be sure to rotate, and don’t plant tomatoes there either! I had a great potato crop in my SFG box last summer. The box was 12 inches high to give the potatoes more room. I had no idea that I could not grow them in the same soil from the year before. Emily, have you planted potatoes in the same square or do you rotate? Ok, and I know you’re gonna think I’m stalking you but I decided to compost starting last fall. I turn it weekly, and we did it all winter (we livein CA so it wasn’t frozen, it was just a little cooler than normal). It was GREAT by the start of spring. I added it to my soil and things are AMAZING now. I love those tomatoe cages! We aren’t planning on growing any tomatoes because our neighbors produce enough to feed a small country, but they sound like a great idea for other climbing plants! I’m pretty sure just one–she gives them 4 squares for each plant. Normally I would recommend 6-9 squares–but that’s because most supports don’t do as well and you get that huge plant lying all over your garden. Wow! Nice work! 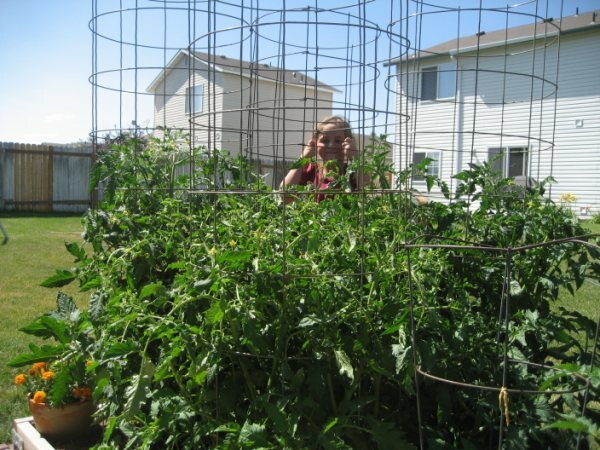 Quick question – is there just one tomato plant in each of those squares/cages?